Turn an everyday kindness into an extraordinary gourmet feast. Show your appreciation for someone special with this beautiful woven willow basket that's overflowing with a selection of pears, navel oranges, a juicy pineapple and seasonal apples, hand-picked and hand-packed from the experts at The Fruit Tree™. Dive into a selection of gourmet cheeses that include a Fiscalini® Cheddar wedge and Brie Creamy Cheese Spread. Snack on sweets that include Old Dominion® Peanut Brittle and Fontazzi Butter Toffee Pretzels. Simply divine.. Turn an everyday kindness into an extraordinary gourmet feast. 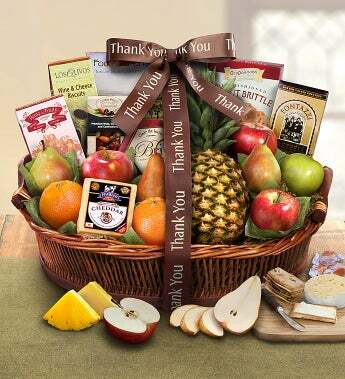 Show your appreciation for someone special with this beautiful woven willow basket that's overflowing with a selection of pears, navel oranges, a juicy pineapple and seasonal apples, hand-picked and hand-packed from the experts at The Fruit Tree™. Dive into a selection of gourmet cheeses that include a Fiscalini® Cheddar wedge and Brie Creamy Cheese Spread. Snack on sweets that include Old Dominion® Peanut Brittle and Fontazzi Butter Toffee Pretzels. Simply divine.